We measure our beads in millimeters because that’s how our bead makers work. Millimeters are also how pearls are measured. So most women are slightly familiar with the concept, just ask one if she prefers a 10mm pearl or an 8mm pearl. You need to be a bit careful using the brass gauges. The electronic ones will give you a digital readout. They are more expensive and must be handled more carefully. 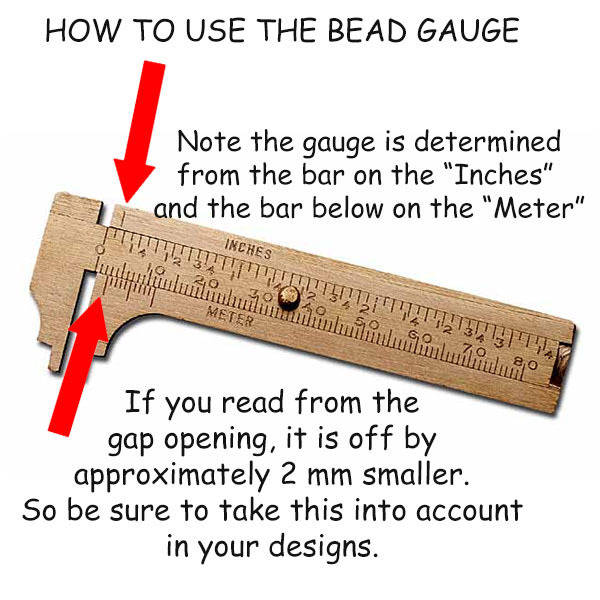 The brass gauge is inexpensive, easy to put in your pocket to take to bead shows or bead stores to be sure you are buying the right size. Well it turns out he was misreading the gauge. But we can learn from his mistake. ← Cheap Rates from China – Dianne Feinstein Answer? or Non-Answer? As always, good info & help. I finally got a digital because, for the life of me, I cannot read a brass gauge. It’s a problem I have always had, so I opted for the digital right away. Thank you for all the great blog, info on Venetian beads & life in Murano.